A stunning 32km guided kayak/canoe descent down the beautiful Ardeche River. Conquer rapids, rock jumps and even a cave swim. The 2 day descent is our most popular activity; join our expert team of kayak/canoe guides whilst we conquer the famous Gorges de l’Ardeche. Over 2 full days, you will get the chance to tackle 32 thrilling rapids, a cave swim and many rock jumps along the way! This is the perfect activity for families, couples and groups and an absolutely fantastic way to experience the Ardeche River. A view through our guests eyes/drone! We take care of every aspect of the activity. 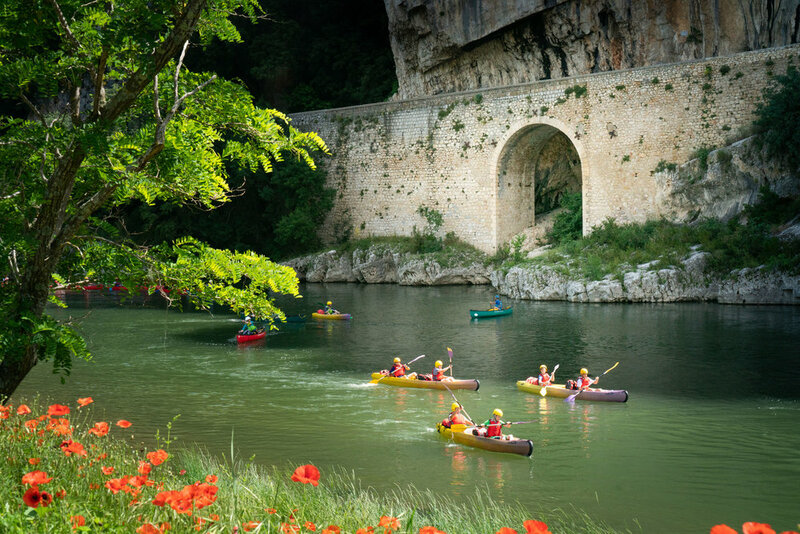 You will be provided with top-of-the-range and regularly maintained safety equipment, and led by a fantastic team of paddlers with over 10 years experience guiding on the Ardeche River. On arrival to the bivouac after your first day’s paddling, a stress-free evening awaits you. Our staff, leaving you to relax with a glass of wine and soak up the stunning surroundings, will cook a healthy and locally sourced dinner for you. After an entertaining evening, there’s nothing like falling asleep in your pre-prepared hammock/tent, to the sounds of cicadas and the river rushing through the gorge. Not only do we teach you to become a confident paddler and get you safely down the river, but our insights and knowledge make the entire journey much more interesting and enjoyable! Our guides know where the best rock jumps and more secluded stopping points are, which rapids are more likely to capsize paddlers and where to find the natural water springs. Whether you want to learn how to read a river or just make the most of your paddle down, you’ll be able to truly benefit from their experience and make the most of your trip. We will provide you and your party with all the equipment required for the activity, including boats, buoyancy aids and helmets. In addition, we’ll also provide you with a 60 litre waterproof bag to protect your belongings whilst on the river. All equipment is prepared in advance and provided to you on the morning of your activity. The price also includes return transportation off the river after the activity is finished. All cars are kept in a secure carpark whilst you're on the activity. More information about the OVERNIGHT BIVOUAC STAY. Below we have mapped out the course you will take with us down the Ardeche River. It shows the starting point in Vallon and finish point in Sauze, as well as the overnight Bivouac spots.